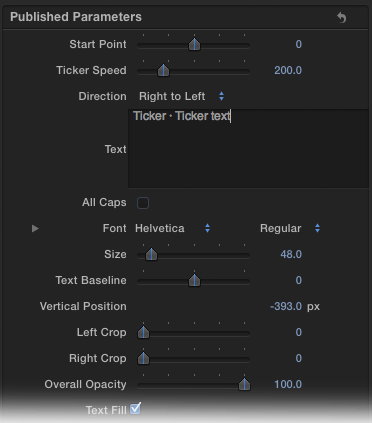 In September 2011, I made an improved version of Final Cut Pro X’s Ticker title. I linked the size of the background of the ticker to the font size of the text and made the title work in different aspect ratios such as 4:3 and 2:1. This new ‘Plus’ version adds some animation and layout options. Now you can have the ticker move from left to right or remain still. You can also choose where the ticker starts moving from, and if the ticker itself is cropped. The duration of tickers can be longer too. The default text position is within the title safe area. You can control the vertical position of the ticker, the transparency, border and shadow of the text and the background. Start Point defaults to starting in the centre of the screen. If your ticker is moving from right to left in a 1920 by 1080 project, and you want to start the ticker off screen, set this value to 960. If your ticker is moving from left to right, set this to -960. If you want to add a transition to bring the ticker background on, set the start point value to a higher amount so that the text appears once your transition has finished. Text Baseline allows for different typeface designs, or instances when you enter more than one line of text. If you include a return in the text, two lines of text will move horizontally. Left and Right Crop crops the text and the background for cases when you don’t want the ticker to be as wide as your project. You can keyframe these values to animate the ticker on and off. There as also controls for Text Fill, Text Outline and Text Shadow. BG Height controls the height of the background relative to a single line of text. There are controls for Background Border and Background Shadow as well. There is a limit to the length of text that Final Cut Pro X/Motion 5 can display as a single item. Text cannot be more than 32,768 pixels wide. If you set the ticker speed to 200 and the size to 48, the title won’t last more than 3 minutes. If you need a longer ticker, overlay a second instance of the title on top of the first with no background (use the background of the first title). It includes an installation script for Spherico’s Motion Template Tool application, if you don’t have it on your Mac, try it. It is a freeware/donationware tool that simplifies effects installation for Final Cut Pro X users. MTT installs effects for Final Cut Pro X in the correct folders, creating them if needed. You don’t need to have Motion 5 or Motion Template Tool installed for these effects to work. Once you have MTT installed on your computer, double-click the ‘Install Alex4D Ticker+ 1.0.mtt’ file. If you need the original version of Alex4D Ticker (for older projects), download the effect archive from here. Downloaded and it’s in final cut x. Wondering where I can find that parameters menu to set the info etc. Just want to thank you for doing this, it’s just saved my bacon… Great work. Thank you. i am wondering how can i change the scrolling direction on the ticker as i am trying to create an Arabic news ticker ? Set the Direction to ‘Left to Right’ and set the Start Point to a negative value. It is great of you to offer these free. They allow us to hone our editing skills hopefully until the day we can afford to pay you for some of you’re creative work.